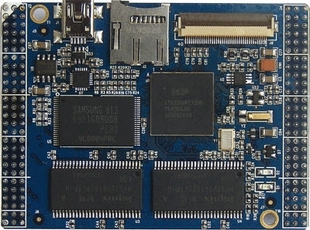 Embest Mini3250 processor card is designed as a compact, stable, and reliable ARM-based embedded controller board. It is ready to be the core of your new product. Measuring only 75mm by 55mm, however it has integrated one LCD connector, one TF card socket and one USB 2.0 OTG port on board, which helps to speed up your development sharply. The Mini3250 processor card is based on NXP's 32-bit LPC3250 ARM926EJ-S core microcontroller which is amongst LPC3000 series, the only ARM9 microcontroller that provides a vector floating-point co-processor. The LPC3000 series is able to run in ultra-low-power mode even down to 0.9V, as well as the lowest power consumption. The LPC3000 series owns abundant peripheral resource; one of the most distinguishing features is to provide 7 UART controllers, which is rare in ARM microprocessors. With such outstanding performance, the Mini3250 processor card is perfect to be employed in Industrial field, Medical Equipment, Intelligent Instrument, Consumer Electronics, Communication Product, and etc. Due to the same footprint of LPC3000 series, Embest Mini3250 processor card CPU is able to compatible with LPC3220, LPC3230 and LPC3240. It enables customers to choose the most appropriate product on their demand. 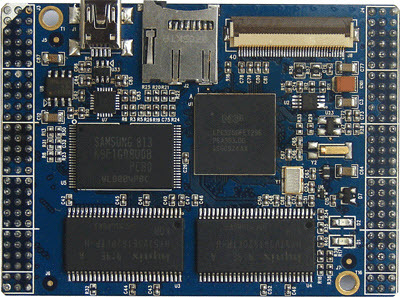 The Mini3250 core board can be mounted directly onto the expansion board of Embest DevKit3250. The whole integrated design has exposed many of LPC3250's features and allows a flexible way of updating Mini3250's capabilities.